Facebook will begin by testing these features in Ireland today. But company tells me “We may test more variations of these before rolling this out globally”, so these will come to everyone eventually. “We want to make visual sharing on Facebook fast, fun, and flexible” says the new camera’s product manager Sachin Monga. The features could revitalize original sharing on Facebook, which a report by The Information says declined 21% between mid-2014 and mid-2015, and was down 15% year over year as of April 2016. Facebook may not be able to squash Snapchat, but by copying its best features, it could become good enough that more users aren’t tempted to shift to sharing with the competitor. Monga calls today’s changes “The next iteration of our test on the camera”, following an August test I called ‘CameraFeed’. That temporarily gave users in Canada and Brazil their first taste of augmented reality selfie masks from Facebook’s acquisition of MSQRD. It also put an open camera window atop the News Feed. Today’s test is a little more conservative, placing the camera off-screen to the left of the News Feed, but making it quickly accessible with a swipe or tap of a Camera button in the top left of the screen. This way, you don’t surprise yourself with a mirror image of your triple-chin every time you open Facebook. Once you access the new camera, you can swipe down to see the different filters Facebook has created, or tap the creative tools buttons to add more effects. Those include everything from pieces of clothing and accessories you can stick on, to geofilters that show stylized graphics describing where you are, to filters that make your footage look like it was painted by Van Gogh. Facebook’s real innovation beyond Snapchat and Prisma are the reactive filters. They cover the screen in leaves you can wave around with your arms, or cool little colored line patterns you can disrupt with your movements. After you’ve created your Faceterpiece, you can post it to the News Feed like normal, except photos shot with the in-app camera appear in glorious full-bleed. Or you can share it with the new Direct private messaging feature. Instead of having to share with tons of people via feed, you can create special conversations about the piece of media you share. When you send an image or video to someone via Direct, they’ll get a notification and see an alert jewel overlaid on the new Direct inbox in the top right corner of the News Feed, similar to Instagram’s own Direct messaging product. There, they can view and respond, with comments showing up overlaid on the piece of media rather than in empty text boxes. Each image can only be viewed once, and then once more within 24 hours using a “replay”. If someone doesn’t respond, and goes 24 hours without using their replay, the conversation disappears, similar to Snapchat’s direct messaging feature. Facebook’s goal here is to get you to share silly, off-the-cuff creations that might be a little too funky to fit in the News Feed where your family and coworkers might lurk. Facebook previously tried to court this micro-sharing, succeeding with Groups and failing with friend lists. But this simple, convenient feature where you pick who you want to share with each time could finally set a smart way to share privately. Oddly, Facebook Direct and Facebook Messenger are completely separate. The strategy lets each product do what it does best without getting confusing. But it also feels fragmented, and could make Facebook’s many sharing surfaces feel redundant. It’s a similar overlap we’ve seen with Instagram Stories and the new Messenger Day stories Facebook is testing in Poland. 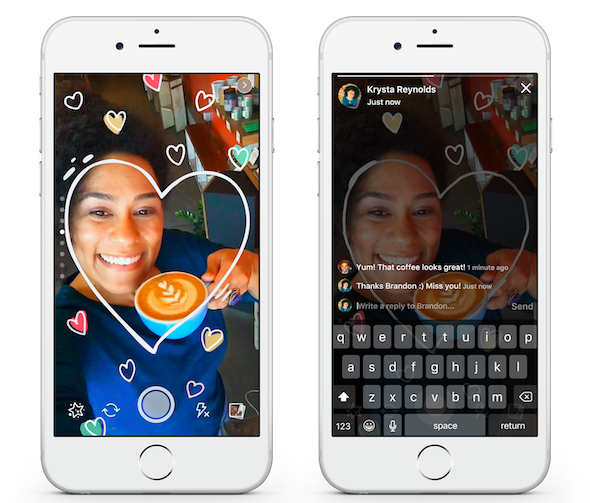 Along with the new style transfers for Live video that Mark Zuckerberg showed off this week, and the Halloween-themed Live masks Facebook debuted yesterday, it seems to be throwing every type of visual communication at the wall and seeing what sticks. That’s the advantage of being a giant company with plenty of profits to spend, staffers to assign, and core utility that people can’t escape. Facebook can test whatever it wants, and doesn’t have to overly worry about disrupting ad income, like Snapchat as it prepares to raise a reported $4 billion IPO next year. If Facebook can make itself seem young and fun again after 12 years on the market, and make us comfortable sharing weird stuff with close friends, it could stay on top as the world ditches text for photos and videos that communicate our personalities much more vividly. Facebook might never be as cool as Snapchat, but it doesn’t have to win back converts, just avoid more loyalists slipping away.